On the other hand, they love to eat. 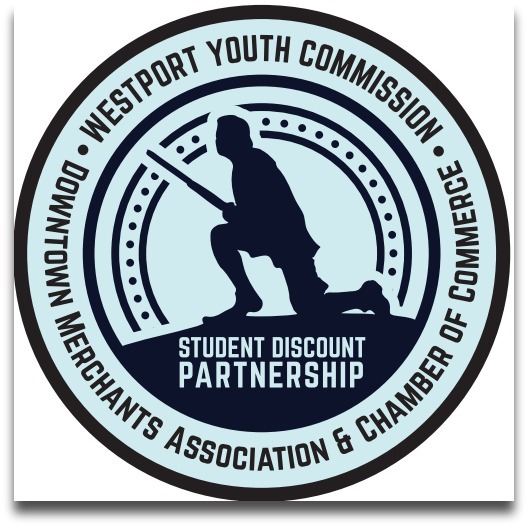 In an effort to convince hungry kids that there are things to do in Westport — like, go to a variety of local restaurants — the Youth Commission has created a Student Discount Partnership. Working with the Downtown Merchants Association and Chamber of Commerce, commission members have signed nearly 30 restaurants (and 2 businesses: Suited.co and Lux Bond & Green). They offer 10% off for Staples, Weston High and Greens Farms Academy students presenting a school ID. Only 2 places said no. Participating locations sport a sticker. The eye-catching Minuteman design was created by Staples senior Julia Schorr. Baker Graphics printed 70, for free. The program began just a couple of weeks ago, with low-key publicity. But participation — and feedback — has been great. 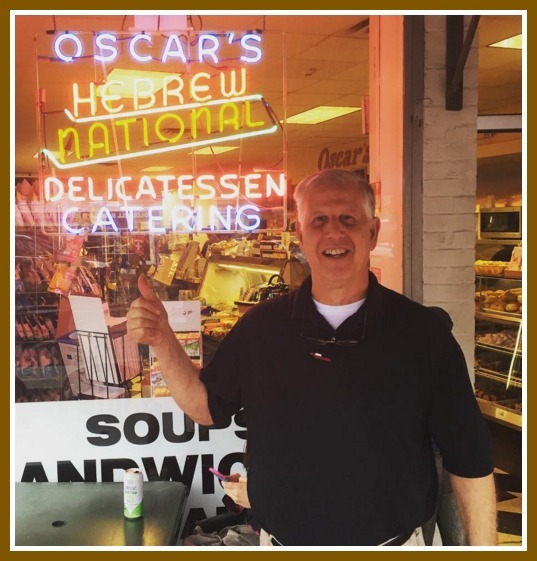 Oscar’s, for example, has seen a definite bump in business, from groups of teens. Oscar’s owner Lee Papageorge gives thumb’s-up to the Youth Commission’s Student Discount Partnership. A girl reported that she and her friends had a great time at Spotted Horse. They gave everyone a discount, even though a couple of kids forgot their student IDs. 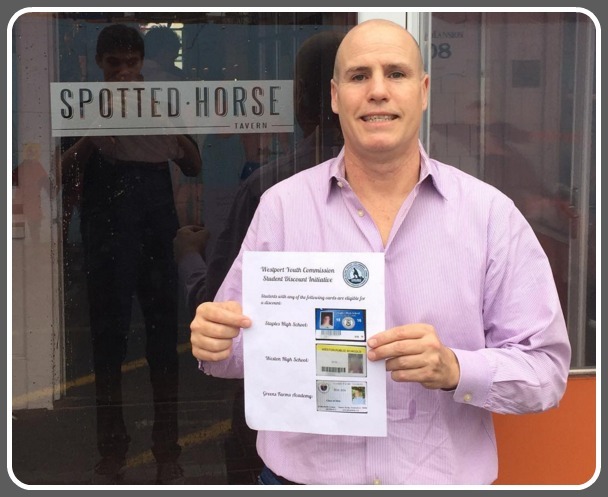 Outside Spotted Horse, with student IDs from Staples, Weston and Greens Farms Academy. “We wanted to concentrate on home-owned places, where kids could have an impact,” says Youth Commission member Reece Schachne, discussing why members selected restaurants instead of chain stores. Publicity has come mainly through Instagram (“wycstudentdiscounts” is the handle). Youth Commission co-chair Kyle Ratner is helping coordinate an official launch this week, with announcements on the “Good Morning Staples” TV show, a story in the school newspaper Inklings, and the website westportyouthcommission.org (launching February 9). You’re probably wondering: Why do Westport students need a discount for anything? Lower prices are not the main aim, Reece and Kyle say. It’s more about making sure teenagers know they have plenty of things to do, and many places to do it, all around Westport. Especially if it involves food. This entry was posted in Local business, Organizations, Restaurants, Staples HS, Teenagers and tagged Kyle Ratner, Oscars, Reece Schachne, Spotted Horse, Suited.co, Westport Youth Commission. Bookmark the permalink. How about Hopkins? Tons of Westport kids go there too. What a fantastic idea, on so many levels! Kudos to whomever put this program together and got it rolling! I’m guessing a hat tip to the kids on Westport Youth Commission?! I’m eager to know what Staples students buy at Lux Bond and Green. This is a great idea, however you know you are in Westport when kids can get a discount at suited.co and Lux Bond and Green! WOW! The students on the Westport Youth Commission (WYC) have done a fantastic job through the planning and development of this new program. It’s an idea that has come up periodically but really started to take form over the past year. They’ve received tremendous support and guidance from Matthew Mandell of the Chamber of Commerce, Steve Desloge of the Downtown Merchants Association and the adult members of the WYC. It’s an exciting partnership between the three groups and hopefully one that will continue to grow to include more schools and local businesses. As Dan mentioned, early feedback has been positive from all sides, which is a great start. Viva Zapata does it as well. Bunch of kids went had great food, watched the game and all get 10% off.. That’s a winning combination of great fun.